Wait. Sometimes the books do come, it just really takes time. Sometimes a lot of time, sometimes just a short amount of time. I’m really glad for Fully Booked and Powerbooks stocking more and more books, so I get a lot of what I want there. Patience is a virtue, a lot of times. So yesterday, I got an email from Mina V. Esguerra, author of My Imaginary Ex, about her new book, Fairy Tale Fail. She told me it was available in ebook format, much thanks to Kindle. Since she’s a local author and I support them, I got myself a Kindle app for iPhone (free) and logged on to Amazon to buy her book. I’ll post a review of her book soon enough (it’s so cute, I promise), but here’s the thing I realized after last night: I just bought my first Kindle ebook. And this means I have access to more Kindle books. I can buy more Amazon books online. And it would get delivered to my iPod. Oh dear. :| I’m going to need extra control over this one, that’s for sure. 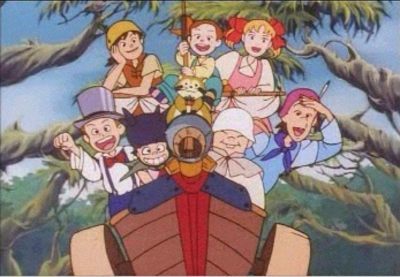 One of my favorite cartoons when I was a kid was the anime Peter Pan, as pictured above. I remember watching that show religiously in ABS-CBN everyday, and especially the extended story, the one with Luna and the mirror and the dark queen. Anyone who was a child during the 90’s surely knows this show, right? I know not all of that cartoon came from the book, but I was curious to read the book nonetheless. What’s cool with classics is that there are free ebooks around, so I downloaded an ebook of Peter Pan and started reading it in between Persuasion. My first impression with Peter Pan is that it was an easier read compared to the other classics I have read. I didn’t have to read it slowly to understand the text, unlike how I read the other books. There was a certain playfulness in the way the book was written that made it fit the characters and the nature of the story, of making believe. I found the characters endearing, especially Tootles, in all his awkwardness. However…I don’t know, it’s just an okay book for me. I liked it a lot, but that’s it. It didn’t give me a huge sense of amazement, unlike when I read an Austen or To Kill a Mockingbird. Maybe it’s because I read it from an ebook? Or maybe because I need to believe in fairies and Neverland more? Or maybe it was because I was trying to make sense of the story too much — is Neverland all in their imaginations? Is Peter just a figment of all of their imaginations, including Mr. and Mrs. Darling? Yeah, I probably did too much over thinking again with this. :P I don’t mean to be cynical, maybe a re-read would change my mind. Or maybe, Peter Pan is the type of book that I’d really rather watch on TV.